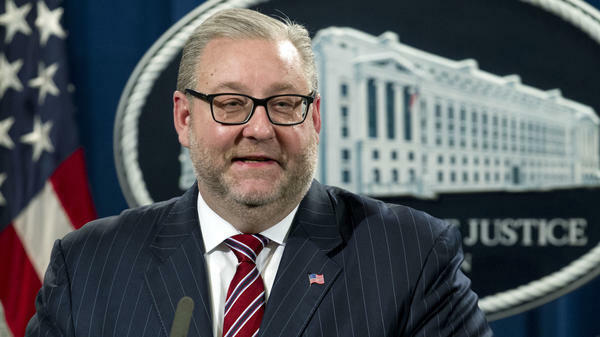 Assistant Attorney General Brian Benczkowski said Wednesday that if doctors or pharmacists behave like drug dealers, the Justice Department would prosecute them accordingly. Federal prosecutors are charging 60 doctors, pharmacists, medical professionals and others in connection with alleged opioid pushing and health care fraud, the Justice Department said Wednesday. The charges came less than four months after the Justice Department dispatched experienced fraud prosecutors across hard-hit regions in Appalachia. The cases involve more than 350,000 prescriptions for controlled substances and more than 32 million pills — the equivalent of a dose of opioids for "every man, woman and child," across Ohio, Kentucky, Tennessee, Alabama and West Virginia, said Assistant Attorney General Brian Benczkowski. "You can rest assured, when medical professionals behave like drug dealers, the Department of Justice is going to treat them like drug dealers," added Benczkowski, who runs the DOJ's criminal division. Those charged include 31 doctors, seven pharmacists, eight nurse practitioners and seven other licensed medical professionals, the Justice Department said. The idea for the department's Appalachian Regional Prescription Opioid Strike Force was formed last autumn to assist areas suffering from high numbers of opioid overdoses and deaths. Justice Department leaders ultimately approved sending 14 health care fraud prosecutors to several different federal districts to help build cases. They started in January, sifting through data analysis to find the biggest outliers. Then, the prosecutors used traditional law enforcement methods, including search warrants, confidential informants and surveillance, officials say. It's not yet clear how many of the defendants ensnared in this round of prosecutions may fight the charges in court. To prevail, the Justice Department would need to prove that prescriptions were written and filled outside the course of normal medical practices and that they had no legitimate medical purpose. In some examples, authorities pointed to "inordinately large quantities, 100 prescriptions per day," or other suspicious facts — such as prescriptions with no evidence of a patient having been physically examined. In another episode, one doctor had a pharmacy operating outside his own waiting room. "This is extreme outlier behavior," Benczkowski said. "We're targeting the worst of the worst doctors in these districts." Authorities said they are working with the Centers for Disease Control and Prevention, the Department of Health and Human Services and local public health officials so that patients who arrive at the doors of medical offices that have been shuttered will receive information and other options for medical treatment. Authorities say one goal was simply to cut off the flow of too many opioids into areas where addiction already has taken a heavy toll. "In my view, if we can save one life, this will have been worth it," Benczkowski said. "We're not going to just come out and try to arrest our way out of the problem." The CDC has reported that 130 Americans die every day of an opioid-related overdose, and federal law enforcement officials have been tasked with trying to stanch the flow of some of those drugs. "The opioid epidemic is the deadliest drug crisis in American history, and Appalachia has suffered the consequences more than perhaps any other region," Attorney General William Barr said. "But the Department of Justice is doing its part to help end this crisis." The efforts will continue, officials say — the strike force is expected to expand into a new area, the Western District of Virginia, starting this week.